Anyone who spends more than a few hours in Vietnam will notice the many white statues of a divine woman usually holding an upside down vase. It’s not some feminine looking Buddha or an “Asian Virgin Mary” — it’s Quan Am (aka Kuan Yin, Kuan Shih Yin, Guanyin or Kannon), the bodhisattva of compassion. 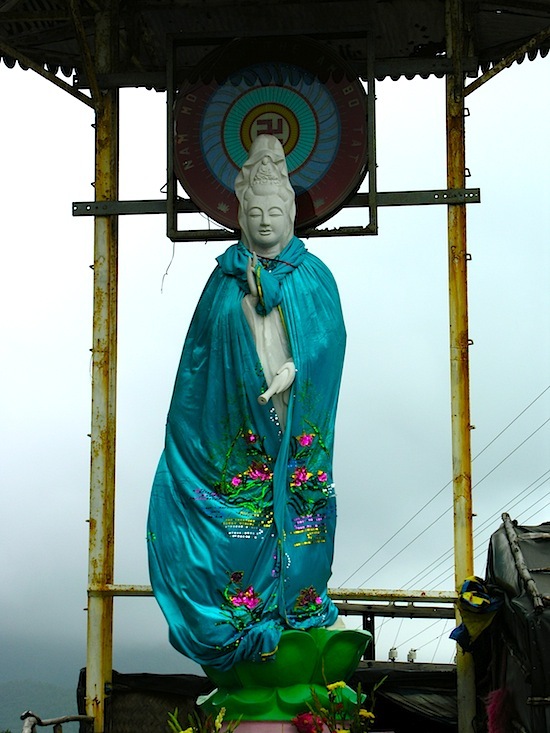 In Buddhist pagodas, on the altars in homes, and along hair-raising stretches of mountainside highway throughout Vietnam, devotees look to Quan Am for guidance, fertility and protection. Quan Am greets the crowd at a festival bearing her name near Da nang and Hoi An. The Sanskrit term, bodhisattva, or bo tat in Vietnamese, refers to a complex and intriguing Buddhist concept, which in the broadest sense refers to any being who devotes their life to easing the suffering of others. Though it’s mainly associated with the Mahayana tradition, the concept more accurately belongs to the whole of Buddhism. The current Thai king, for example, is believed by many of his Theravada Buddhist subjects to be a bodhisattva in the flesh, and Shakyamuni Buddha, or the historical Siddhartha Gautama who founded the Buddhist religion 2,550 years ago in India, is considered by Theravadans to have first been a bodhisattva over many lives (the stories of which can be found in the Jataka Tales). But in the Mahayana Buddhism practised in varying forms throughout east Asia and beyond, the concept is taken to another level. All bodhisattvas take an oath to lead all sentient beings from suffering before allowing themselves to become fully enlightened buddhas. In the Mahayana view, bodhisattvas are often iconic figures who can yield magical powers and are similar in many ways to gods or goddesses in the Hindu view. Quan Am is considered a ‘descendent’ of sorts of the ‘original’ bodhisattva of compassion, Avolokiteshvara, a male or sometimes androgynous icon that originated in India with a Sanskrit name which means “he who looks upon the world with compassion”. In India and Tibet, Avolokiteshvara has retained its original male identity (the Dalai Lama is believed by Tibetans to be a reincarnation of him), but in seventh to 11th century China the icon transformed into a female goddess figure, Kuan Shih Yin (literally: observer of the cries of the world), or Kuan Yin for short. In time, this female version of the bodhisattva of compassion was embraced by the rest of Mahayana east Asia, including Vietnam. Avolokiteshvara/Kuan Yin is sometimes depicted with countless arms and faces which signify his/her ability to see and help all sentient beings. An image like the stunning one pictured below (from the Vietnam National Fine Arts Museum in Hanoi) could be referred to either as ‘Avolokiteshvara’ or ‘Kuan Yin’, but most Vietnamese would consider it a depiction of ‘Quan Am’, which is how the name ‘Kuan Yin’ has been rendered in the Vietnamese language. Now that’s how to get things done. Quan Am is more commonly depicted as a graceful woman holding a willow branch, which represents healing, and a vase turned upside down, signifying how she actively cleanses and purifies — at least that’s one perceived significance but there are others. 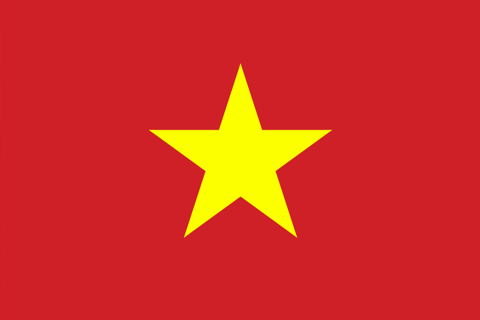 In Vietnam and other east Asian countries, there can be no overstating her popularity. 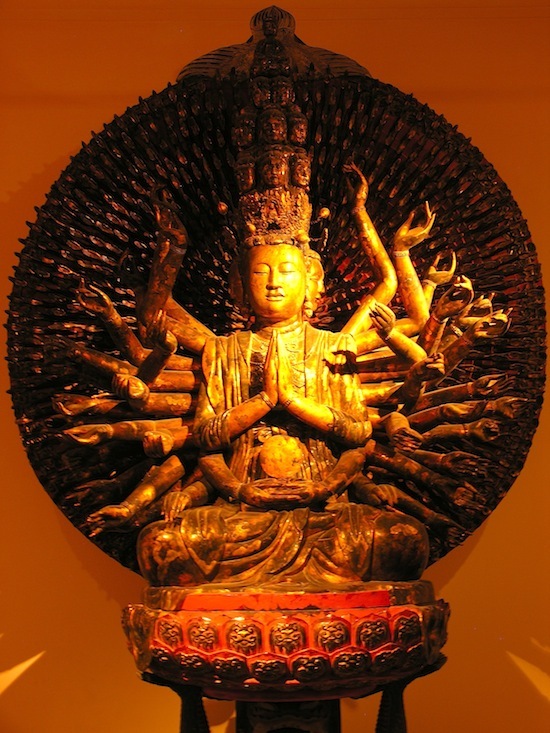 Eight of the 15 largest Buddhist statues in the world are depictions of Kuan Yin. The vast majority of Vietnamese Buddhists (and Japanese, Chinese, Taiwanese and Korean Buddhists for that matter) belong to the Pure Land school. In this type of Buddhism, the key figure is Amithaba Buddha, or A Di Da Phat in Vietnamese, a separate buddha unrelated to Shakyamuni who presides over the Pure Land — a mythical sort of heaven that’s free of all suffering and is believed to exist in some alternative realm of reality. Adherents believe that by chanting Amithaba’s name every day and living ethically, they will be reborn to enjoy numerous blissful lives in the Pure Land. This school of Buddhism also worships a number of semi-divine icons, including other buddhas and a pantheon of bodhisattvas, but chief among them (apart from Amithaba) is Kuan Yin. If facing the altar in Pure Land pagodas throughout Vietnam, Quan Am stands to the right of A Di Da Phat, accompanied to the left by The Chi (aka Samanthabhadra), the bodhisattva of action and energy. Kuan Yin is the star of many legends. Sometimes she arrives like a superhero, riding dragons and rescuing shipwrecked sailors, but most stories depict her as a more motherly, even down-to-earth sort of goddess. A steady theme in Kuan Yin mythology is that while she instigates or coerces sentient beings to be kind, patient and generous — all of which leads to good fortune by way of karma — ultimately it’s up to each individual to do the right thing. Vietnamese Buddhists pray to Quan Am at all points of life. If seeking a baby, she’s a fertility goddess. If struggling with money, she’s a generous giver. And if all is already perfectly fine, she provides guidance on how to make it better. Adherents understand, though, that these aren’t just blind wishes — they also require some effort on the part of the wisher, specifically to be kind, generous and ethical in life. Quan Am watches over a cliffside highway south of Tuy Hoa. Of course, few if any Vietnamese Buddhists would neglect to believe that Quan Am might swoop down on an emerald dragon to save the day. On the other hand, the goddess is believed to possess the power to take infinite forms, and many Vietnamese believe that she appears in the subtlest disguises, just when she’s needed most. To see Quan Am in “action”, simply walk into virtually any Buddhist pagoda anywhere in Vietnam. 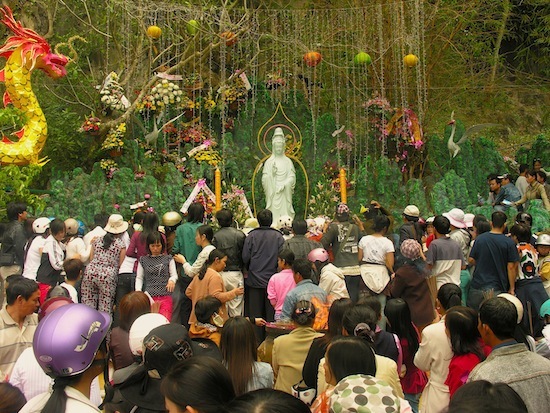 If wanting to gain a better understanding of the intense faith that many Vietnamese Buddhists have for her, try to factor the Quan Am Bodhisattva Festival into your plans. 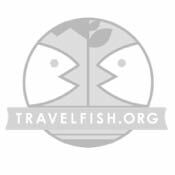 It takes place every year in mid-April just behind Marble Mountain on the road from Hoi An to Da Nang.